My Mr. Postman brought me a lovely package in the mail. There are 12 lovely fat quarters, in shades of blue and brown. Matched up with more from my stash, they should make up into a lovely Yellow Brick Road. I have been wanting to do one of these for awhile, but didn't quite have the fabrics for it that I wanted. I don't know what it is about this fabric and colour combo that I like so much, but it really speaks to me. I find it very calming. Come to think of it, these are the same colours in my living room area rug. Well, I'm consistent, if nothing else. Andrea is coming this afternoon for her fitting, so I think I'll go and see if I can get a border or 2 sewn onto my freeze frame quilt before she gets here. There has been very little quilty stuff done at my place for at least the past week. I think I'm going into withdrawal. I have sooooo many projects I want to start, and others I want to keep going on, but, I must focus. Six and a half weeks, and 3 dresses. (sigh) So, I'll go play for the next couple of hours, and then, it's dress time. It's, as usual, taking me longer to get around to writing, and posting the pics. I have this terrible habit of overestimating exactly how much I can get done in the course of a day. But, I do have the lace sewn onto the veil, and all the beading done. I took it to work with me over the weekend, and worked on it over my supper, and coffee breaks. Two more hours this afternoon, while hubby had a nap, finished it off. It is hard to see in the picture, but there are beads all around the edge of the lace, as well as in the centre of the scalloped edges. The fabric is also a lot more sheer than the picture shows, but the light of the flash kind of bounced of the fabric, making it look opaque. Then, it was time to go through my cookbooks, and figure out what we needed for groceries, and then to go out and get the groceries. Next to doing laundry, I think grocery shopping has to be my least favourite thing to do. By the time the stuff gets put away into the cupboards, or wherever, it has been handled how many times? My wonderful husband, Scott, is usually the one who does the grocery shopping, but I had specific things I wanted this time around. I'm hoping to lose 5 more pounds before June 12, so it's back onto the weight watchers menus. I have a really good cookbook of theirs that I have used a lot in the past, with success, so I'll try for more. Becca and I went out today to buy the rest of the supplies to make her veil. So far, the fabric, an ivory organza, cost $5.95. The lace and the beaded trim to go around the edge, cost $8.95. 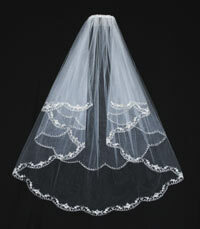 So, total cost for her bridal veil so far is, wait for it.............. $14.90. I still have to get the comb that it attaches to. So, she'll get a veil, probably for under $25.00. The bridal store wanted $250.00. Something wrong with that picture. I have the lace pinned on already, but then had to leave to go to work. I'm hoping to get the lace sewn on tomorrow, at which time I'll post a pic. Her bridal shower is on May 1st, at which time I'll be able to post pictures of her wedding quilt, which I'll be giving her then. My son, Noel, and his wife, Laurie, are coming down for the day of the shower, and it will be so nice to see them have the whole family together again. The last time we saw them was for Noel's Grandma's funeral, so it will be nice to be together for a happy occasion. I also got the decorations for the chairs on the ends of the aisle, for the ceremony, figured out, and I'll post a pic of those tomorrow too. The wedding is getting so close, and getting really exciting. Seven weeks to the wedding. Six weeks until my dear friend and sister in the Lord, Susan arrives. She says she has to be here to keep me sane, although it is questionable whether I am sane now. (giggle). She has also promised to stop me from climbing the walls, and generally falling apart. And, if I do fall apart, she'll help pick up the pieces. I haven't seen her in almost 8 years. We talk all the time on facebook chat, but, it's not the same, although it's a whole lot better than the years of expensive long distance phone calls and waiting for "snail mail". We are "kindred spirits" and I miss her terribly. She'll be here a week before the wedding, and stay for 2 weeks after. YIPPEE!!! We can talk, and have tea, and sit in the yard, and sew and quilt, to our hearts' content. I wonder what it will be like to talk without the facebook chat timelag, and waiting to read what the other has written? I wonder if we'll run out of things to talk about? Probably not, since it hasn't happened yet, after 24 years, 18 of which, she has lived either in New Bruswick, or Alberta, after moving away from London. True friendship like this is a gift from God, to be cherished and for which to be thankful. Here's Sandra's "Animal Party" baby quilt. She wanted a basic meander as quilting design. The thread is Rainbow's pinks and So Fine in the bobbin. The fabric, and pattern are from http://www.madaboutpatchwork.com/ which is an online store that Sandra's daughter runs. I'm working this weekend, at the hospital, so, I'm going to go and load another quilt before I go. Well, I've officially added yet another task to my to-do list for this wedding. Becca and I went out to finalize the flower arrangements, and, while we were out, decided to use the time to get a few other things done. She had yet to decide what to do about a veil, so, off to the bridal shop we went. She has decided, after looking at the samples in the store, that she wants a short, single layer basic veil with a little bit of beading around the edge. The store, for this piece of tulle, probably less than a yard of fabric in it, has the audacity to want $250.00. For a piece of tulle that would, maybe, be $10.00 a yard. I nearly choked. I had gone in the store thinking, we may as well buy it, rather than me make it, since I'm already rather overloaded, but, there is no way on this earth I'm paying that. So, guess what else I'm doing. (sigh) Cutting it out, and gathering it onto the comb is a piece of cake. A little hand gathering, a little hand sewing, and that is done. It is the beading that she wants that will take the time. Ah, what a mother does......... I had already, almost a year ago now, gone out and bought a whole pile of different beads, at the time thinking that I would be making her dress myself. I must confess to being glad that she found, and bought her perfect dress. But, I still have all these beads. Looks like they will be getting used. Well, the pattern is drafted. And, since I don't have enough muslin to use to give it a dry run, I can go back to work on my quilt. Woohoo! Tomorrow, though, I have to get out and get the muslin. How is it possible, though, for a quilter not to have any muslin? My daughter's wedding is exactly 2 months from today, and there are 3 dresses to finish. One is almost done, just needs final fitting. One is at the first fitting stage, and the last is the one I just finished the pattern for. I hadn't wanted to cut it this close, but 2 out of the 3 girls are in their last weeks of school, with exams and projects and other assorted craziness, so, the dresses have to wait. School is the first priority for them, as it should be. So, off to quilt, I go. I've been working on one of Judy Laquidara's quilt for an hour projects, "Freeze Frame", for the past week. It's all pieced, and just needs the plain borders sewn on. I'm happy with, both her instructions, and the way it looks. I liked the colours she used in her version, so I've sort of kept to the same, especially the yellow. And it is all stash fabric. I'd love to sit down and finish it, right now, but, I HAVE to get the last bridesmaid dress at least to the final pattern stage today. After that, I'l probably reward myself with some quilting. I really do have to figure out how to put links in these posts too. Any help would be greatly appreciated. I can't believe how long this crazy cold is hanging on. I've been to the Doctor, who says there is nothing to do but wait it out. (groan). I know antibiotics don't work on viruses, so there is no point taking any, but this is getting quite tiresome. On a positive note, I've decided that the half hexagon quilt is indeed finished. And, since I have no energy for doing anything else, I've started another quilt, as if I need an excuse to do that. It's from Judy L's site Patchwork Times, and it is her Freeze Frame, that she set up as being able to do in one hour increments. I like that format. It is all from stash fabric. I ordered a lot of fabric after Christmas, when Thousands of Bolts were having a sale, and am finally starting to use some of it. ( I really do need to figure out how to put links into my posts). There was no way I could pass up fabric at $3.00 a yard, including shipping, and duty and Canadian taxes when it crossed the border. At least, that was my excuse. The reality is probably closer to I would have bought it anyway, just not as much. (giggle). Actually, this is my retirement savings plan - except it is fabric, not cash, I'm saving for my retirement, which does do a bit of a number on cash savings, but then, I won't need to spend it later. Oh boy, I'm really getting "out there" with the rationalizations now, aren't I? Ah well, I'm going to go play for awhile, and I guess I should throw in some laundry to go while I play. Half hexagons finished, I think. I've spent the last couple of days, (in between sneezing and hacking and coughing- rotten cold), playing with my 5 inch charms and 2 1/2 inch scraps, and cutting half hexagons. Then, the fun part was arranging them on the wall. Looking at the picture, I can see a couple of areas where there are too many darks together. But, other than that, it is close to be ready to sew. The trick is going to be sewing it together without mixing up the placements of the fabric. I'll have to do some labeling of the pieces, I think, to make sure they stay in order as I sew. That is the next task on my list for today. I should be working on a bridesmaid dress, but my mind won't focus enough to do that. There are pattern alterations needed, which means I need to be thinking clearly, before I tackle that. It is Easter Sunday, the day we take to celebrate the resurrection of Jesus, our Saviour. I have a favourite Easter hymn, that is beautiful, both when it is sung, or when it is read as poetry. That's one of my tasks for today done. The rest is easy.... go outside and enjoy the sun. This quilt used the pantograph "Plumage" from Willow Leaf Studios. I used Rainbows thread in the top, and a regular yellow in the bobbin. Some kind soul, in the last week, or so, has shared a questionable gift with me. My throat is sore, my chest is tight, and my head is stuffed full. Yuck! This kind of gift I could well do without. (sigh & groan). However, I am determined to try and ignore it. I have a quilt on the machine that I want to finish, and then I want to get our and enjoy the glorious day. Even if it is doing nothing more than sitting and doing some hand work on "Cactus Rose". I'll post a pic of this quilt, that I am trying to finish, once it is done, and off the frame.